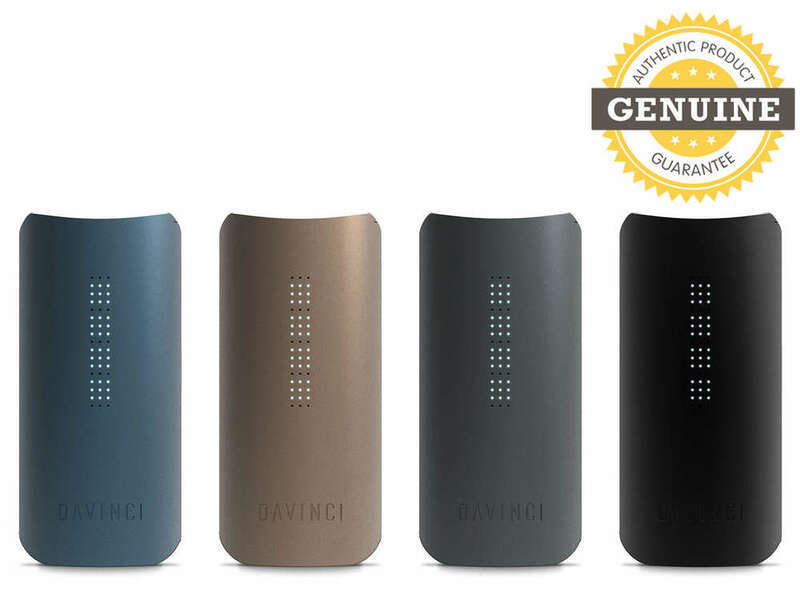 Introducing the fantastic DaVinci IQ Vaporizer, in a choice of four great colours - a hot contender for best ever portable vaporizer! Please remember - WE ARE AN AUTHORISED DAVINCI RESELLER AND ONLY EVER SELL AUTHENTIC BRANDED PRODUCTS - BEWARE OF FAKES! This is a very sophisticated, advanced vaporizer, which also looks great and feels great in the hand! Its compact, sleek body encases a device that is full of technological advancements, such as unparalleled battery life, precision temperature control, smart pad technology, Bluetooth phone app, zirconia mouthpiece and ceramic vapour path and 51 LED display - for exquisite control. It has a removable 18650 3500mAh battery, which can be charged either via the device itself (it has a micro USB port), or you could use a separate charger, for speedier charging. Having a removable battery means that you can carry fully charged spares - great for if you are on the go with no access to a charger! The IQ is constructed from only the finest materials and the all ceramic vapour path gives increased vapour production and great flavour. You have complete control over your vaping sessions and there are 3 different control modes - Precision Temperature, SMART PATH and Boost. Precision mode will maintain the temperature that you set the IQ at, which will be displayed on the stunning 51 LED display. SMART PATHs are pre-programmed temperature settings which will increase gradually throughout the session and can be set at one of four programmes, which can also be further customised using the phone app. Boost Mode, as the name suggests, will give the temperature a quick boost at the touch of a button, quickly cooling back down when you take your finger off the button. You can also put the IQ in "stealth" mode, which dims the LEDs. Many premium vapes have a Bluetooth phone app these days, but the IQ's is arguably the most sophisticated and the most useful. In addition to setting a custom SMART PATH as discussed above, it can also control every aspect of the IQ, including turning vibration alerts (for when the device reaches desired temperature) on or off. It will also give you device information, such as total usage time, average session length, average temperature and favourite SMART PATH. It also gives you access to a comprehensive plant guide, walk-through guides, the PDF user guide/manual, a troubleshooting link and FAQs. The app can even be used to switch the IQ on! There are some nice accessories included (see photos), namely 2 mouthpieces (one of which can be used with the water pipe accessory - available separately), one 18650 3500mAh battery and charging cable, a carry can, a keychain tool and some cleaning tools. Remember - we ONLY EVER sell Authentic goods!